With winter fully underway, we scurry about from location to destination to escape the bitter cold and wind. 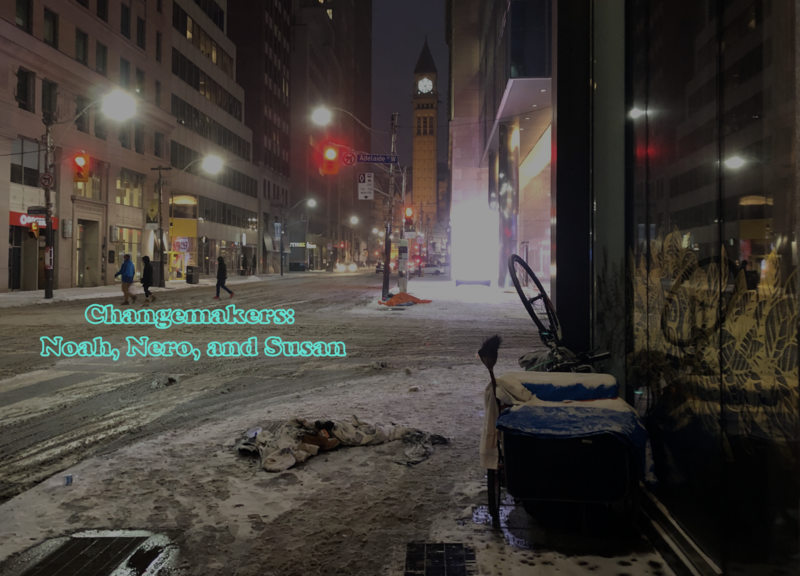 On the edges of the campus and around town, often noticeable are the city’s homeless – taking cover around bus shelters or on top of subway grates that provide some warm relief against cold discomfort. 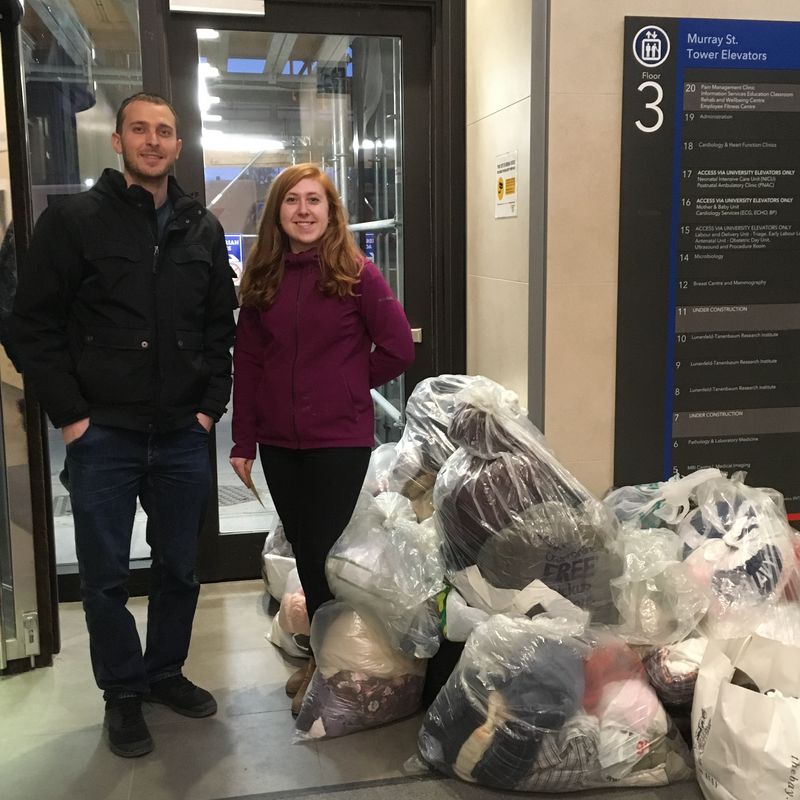 Noah, Susan, and a mountain of donated clothes. While cash is welcome, most of the donations are in the form of clothing collected at one of four deposit boxes. Three of the boxes, cloaked in wrapping paper for visibility, are located on the 8th, 9th and 10th floors of the Mount Sinai Hospital (600 University Avenue) with a fourth located on the 5th floor in the 60 Murray Street building of the hospital complex. To help with the logistical aspect of distributing the donated wares, the clothing drive has paired up with the Fred Victor social service organization. At multiple locations across the city, Fred Victor – through its numerous programs aimed at alleviating poverty – provides a variety of housing, health and financial assistance. Assistance through housing support and shelters helps many, with the population using Toronto’s shelters fluctuating between 5600 to just over 7000 during the past year. Yet, estimates suggest that hundreds are still forced to sleep rough. While we keep a watchful eye on the weather forecasts and temperature displays on our phones when deciding whether a trip to the grocery store is worthwhile, for some it’s only a question of covering up and holding on. For these individuals – especially the unsheltered homeless – donation drives and charities provide them with one of their few resources of comfort when there is little else to turn to. Working in collaboration with Dr. Sachdev Sidhu, Noah Manczyk studies the binding of ubiquitin variants to their substrates through X-ray crystallography. Susan Kelso is investigating protein interactions made by the human F-box proteins, identifying new SCF ligase substrates and exploring the interactions that regulate their cellular function.